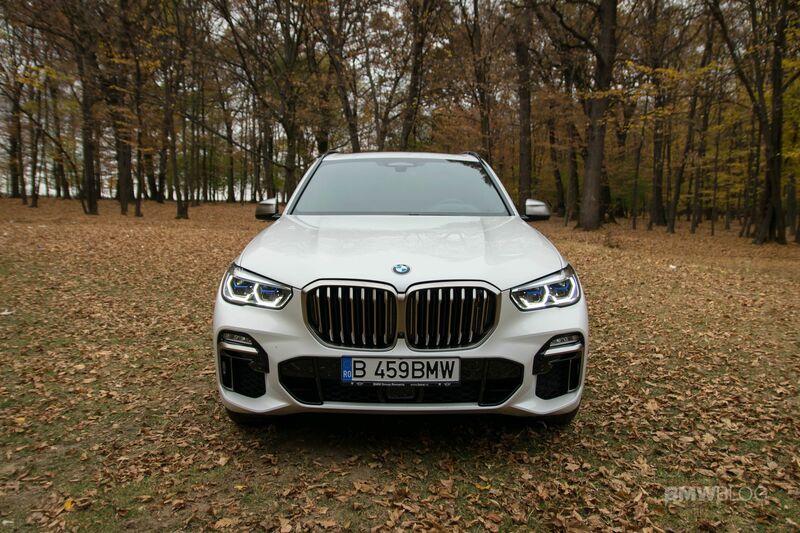 We test drove and reviewed the new 2019 BMW X5 M50d which went on sale this Fall. I still remember the marketing campaign for the third generation BMW X5. The F15 X5 marketing materials received all the usual tricks to increase the attention a new car gets, on all platforms, including a set of commercials. One of them presented the car as “The Boss” in a spot called “Respect”. In the commercial, the F15 X5 was driven on a variety of roads and got respect from a number of people, including a gang of mean-looking bikers, carnival-goers and even a freight-train. It was a nice effort and definitely got the point across: The Boss is here and will the get the respect it earned over the years. 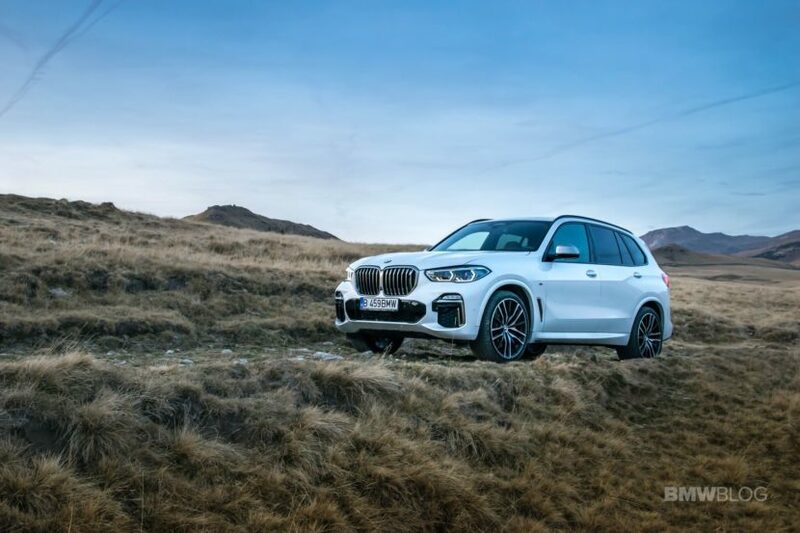 The X5 hasn’t had an easy life from the get go, no matter how peculiar that statement might seem in today’s automotive climate. Now we’re used to seeing all sorts of SUVs on the road, but when the original X5 was first mentioned, BMW was a completely different company. 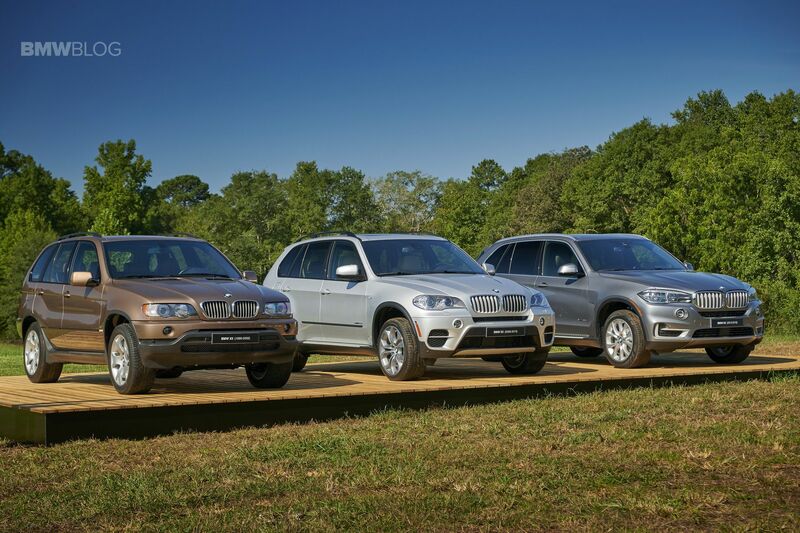 To get a better idea, think about the fact that the X5 was first designed in the late 1990s. When you think of that period, what cars with the BMW roundel immediately pop up in your head? I’m going to guess anything along the lines of the E46 3 Series and E39 5 Series. Well, that’s because they were not only writing history at that time but they were also the undisputed kings of their segments. 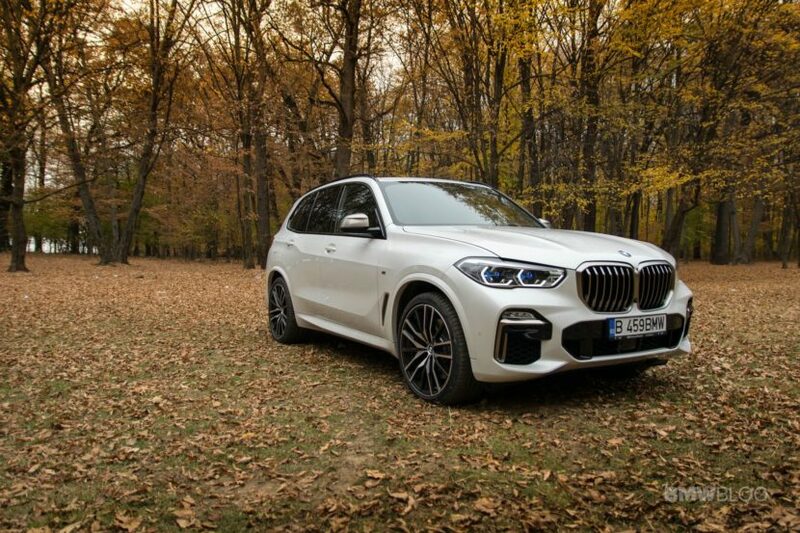 Furthermore, creating an SUV just didn’t seem like the right thing to do for a brand like BMW, especially since you’ve invested serious time and money into creating a sporty and luxurious image. Luxury and Utility don’t really mix, or do they? The first car maker to truly grasp the two at the same time was Mercedes-Benz with its ML model which beat the X5 to the market by some 12 months. 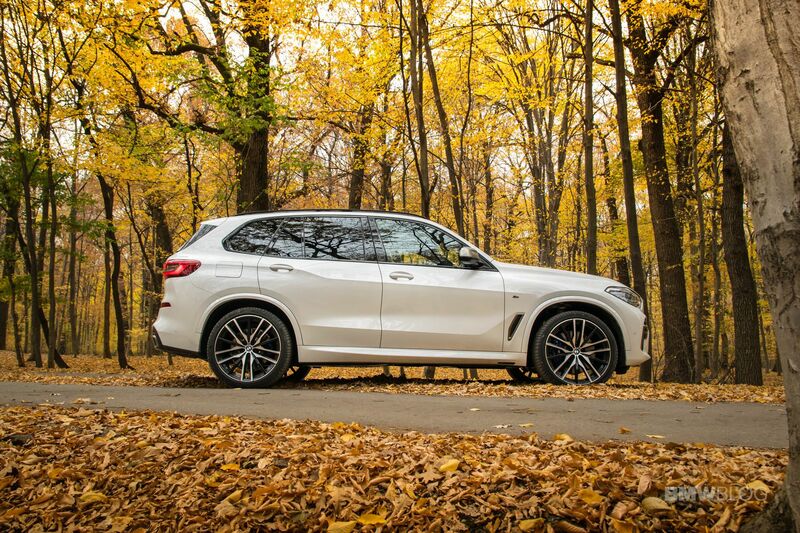 The X5 wasn’t far behind and ever since, the two have been dueling in their segment, for the title of the best Luxury SUV. 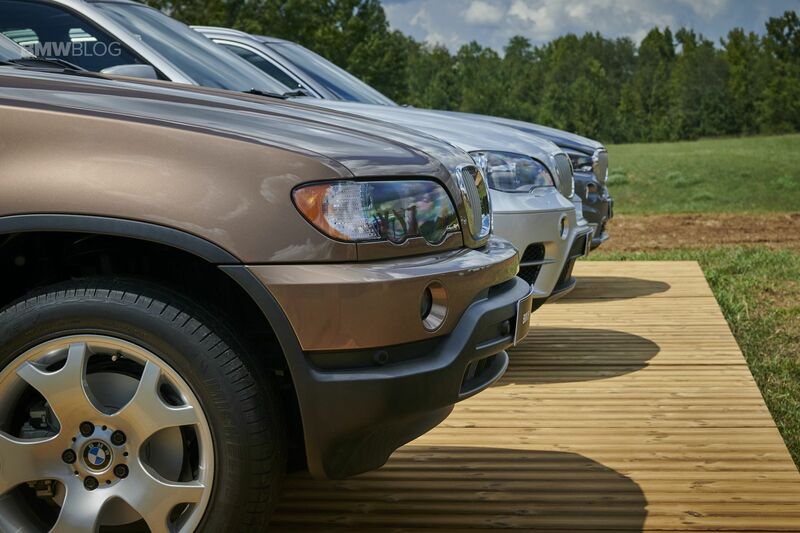 The original X5 didn’t have an easy life, as most enthusiasts felt like this was a betrayal from the brand they loved. 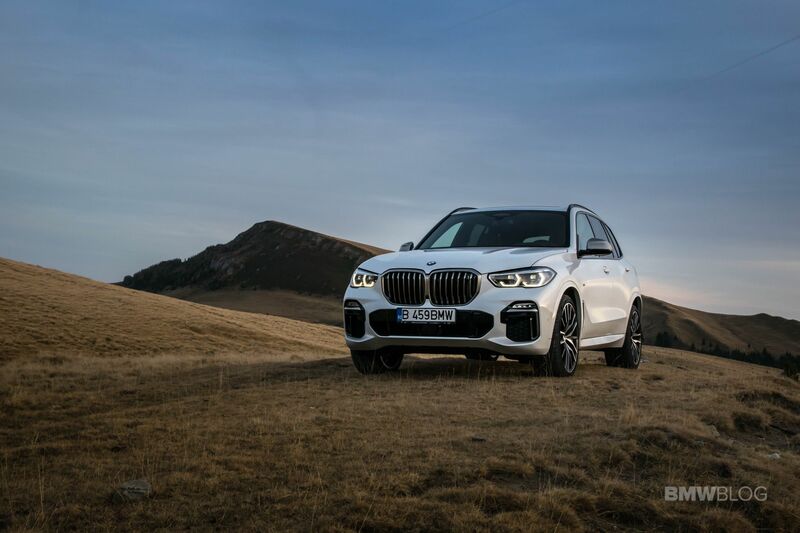 However, time proved that the move the management made back then was a smart one as the X5 became one of the best-selling cars in the BMW roster. Over the years the Germans sold over 2.2 million cars with the X5 badge on the tailgate, an impressive number considering there have been only three generations out so far, one of them reaching the end of production a lot sooner than the usual seven years cycle. That brings us to the latest version, the fourth generation, the BMW G05 X5. The new model was unveiled earlier this year with deliveries kicking off this month and signs show it’s going to be a best-seller once again, thanks to its new chassis, better looks and new technologies. 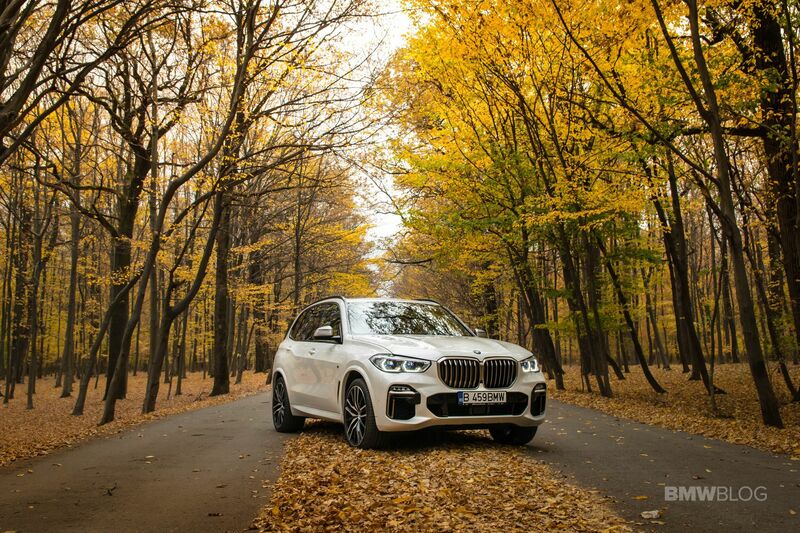 From the get go you’ll immediately recognize the new X5 thanks to its design. On the outside, the car received an evolutionary take on what have become classic SUV cues since the X5 was originally launched. Take a look at the models that came before this new X5 and you’ll notice a few things. The front-end is aggressively styled, with flared nostrils and a massive bumper, especially in M Sport guise, as was the case with our tester. The kidney grilles have grown quite a lot in size and would’ve been the largest ever fitted on a BMW if the X7 wasn’t around. However, despite their size, in real life the car doesn’t look off balance. That’s because it has grown in size in every other aspect and the grilles just fit in this new picture. The headlights might’ve shrunk a bit but overall, the front-end does look good. Move over to the side of the car and you’ll notice a couple of things, depending on how the car is configured. There’s a new character line going from the headlights to the taillights, over the side of the car and above the rear wheel well. 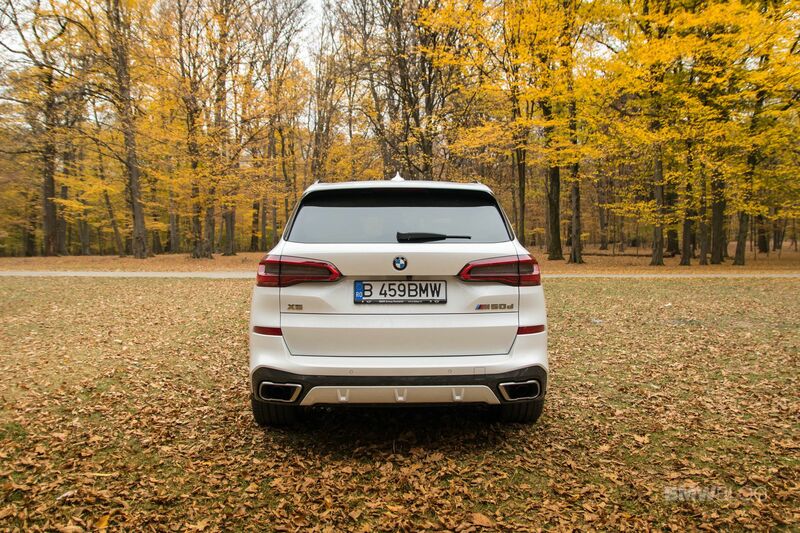 It’s mostly noticeable on cars painted white and it adds a bit of character to the overall theme of the X5. The new model can also now be fitted with 22” wheels as standard, should you decide to do so, the largest wheels ever to be offered on a BMW model. Our tester had the Bi-Color style 742 M double-spoke wheels on, a combination that’s absolutely striking. Round the back, the old massive, squareish taillights are gone and, instead, new, sleeker LED-lit ones are now decorating the rear end of the new X5. Combined with the new exhaust system tailpipes (which are real, by the way, unlike on other SUVs), the package delivers a strong statement, one of confidence and style at the same time. Overall, I’d say the design of the new X5 is a home run, one that definitely differentiates the car in the current line-up. Step inside and things are even more different than it was the case on the old F15 version. The dash is still layered but that’s about it when it comes to similarities. 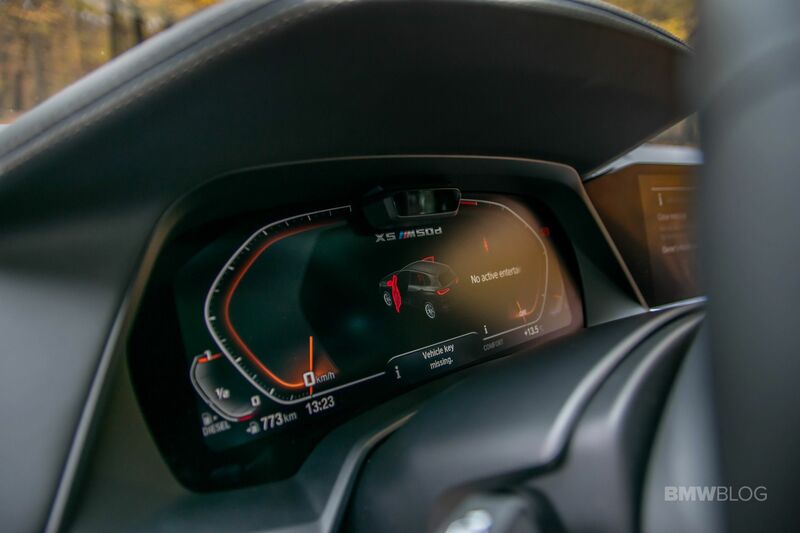 The new instrument cluster will definitely get your attention from the moment you step inside, as it has a beautiful animation telling you exactly in what car you just hopped in. The resolution is superb and the design beautiful, truly taking BMW to a new level, on par with the competition. The Live Professional Cockpit option brings hexagonal designs for the speedometer and rev counter while in between them you can configure your car to display the map of your surroundings and your navigation route if you’d prefer. On the sides of the map, in the center of the speedometer or the tachometer, you get more useful information. From the speed readout or the speed limit, to the fuel consumption, a G-Meter, power and torque scales and even entertainment details. The best part is that you can configure how it looks and what info you want displayed. The thing is, you’ll need some time to get used to the new layout. That’s understandable too, as we’ve grown used to round gauges. Furthermore, the differences between the different driving modes are a lot smaller now. If in the past, when you’d enter Sport mode or Eco Pro mode, the entire layout of the gauges would change, on the new ones, only the outlines are different and only in terms of color choice. Go for Eco Pro and the instrument cluster suddenly becomes blue, while Sport mode changes that to red. 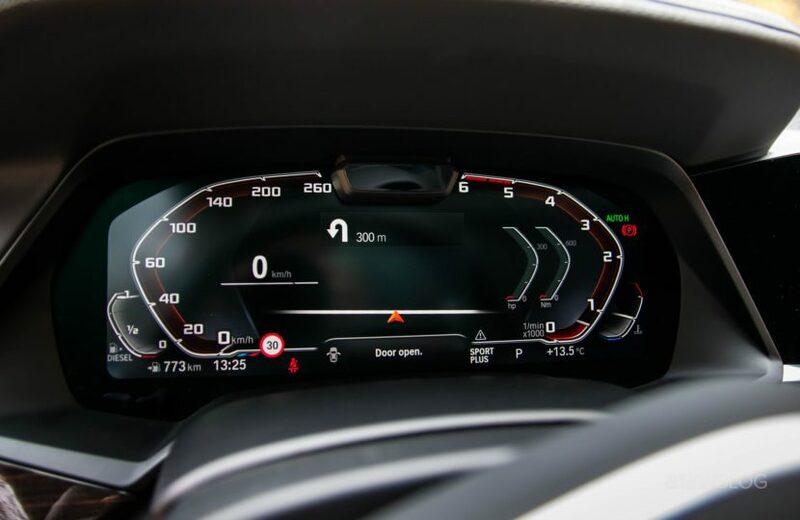 However, nobody will really care about that as the new Head-up Display brings a lot more info right to the windscreen, allowing you to keep your eyes on the road at all times. Since you get an infrared camera in between the speedometer and rev counter, to check out if your eyes are on the road at all times, the two work together flawlessly and actually make looking in the dash a bit old-fashion. 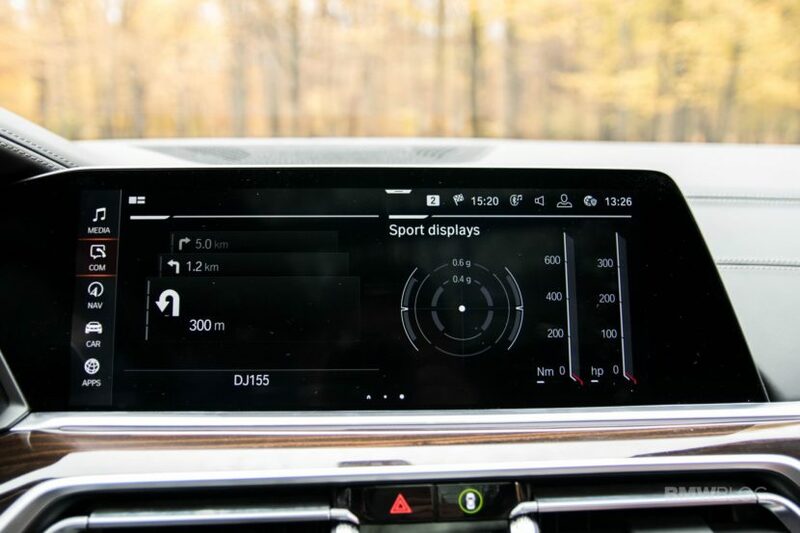 The new HUD even changes its design when entering sport mode, showing an arrangement similar to what you get on M cars, with a rev counter and everything. On the right side of the new gauges you get a brand new iDrive screen which has also grown in size. 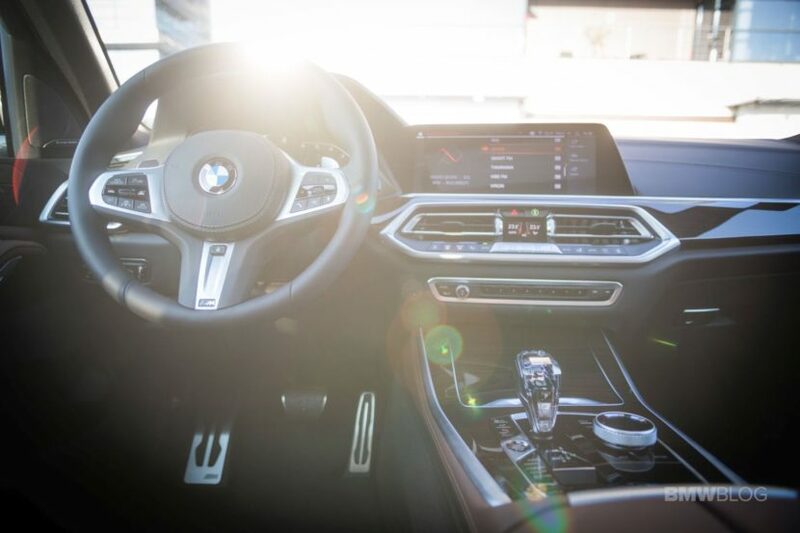 On it you’ll see the iDrive 7.0 system if you go for the Live Professional Cockpit option or the older iDrive 6.0 system if you decide to skip on it. Both of them work fine and it will take a bit of time to get used to the new one as well because the differences are massive. The biggest one is the layout. Whereas on the old model you’d get six sub-menus on the screen, over two pages you could switch between, this time the submenus are located to the left side of the screen and there’s only five of them left. Yes, the sub-menus have been concentrated and they are easier to navigate through. Furthermore, there are a couple of shortcuts available as well. Slide your finger from the top down and you get a sub-menu which basically allows you to configure your car faster. If you reckon that’s mighty similar to what you’d get on a smartphone these days, you’d be right and it’s pretty obvious BMW took a couple of hints from the phone industry in other areas as well. The iDrive screen, for example, can be configured to show exactly what info you consider relevant. In that regard, you get to arrange tiles on it the way you like to, with the relevant info to match. You can adjust the size of these tiles, in a similar manner you would adjust the size of widgets on Android phones. It’s quite nifty and works like a charm but it can get a bit confusing at times. But that’s just nitpicking because, when dealing with the new X5, it’s hard to find glaring faults with it. Therefore, you have to become a bit of a snob to highlight even the smallest flaws so that people don’t call you bias. It’s an incredibly well-made car and the interior shows it in most areas. The seats are new, the leather you can get is top notch, and the space and interior lighting (especially at night) makes it feel like home. My biggest gripe in this regard is the new transmission selector lever and how it feels if you go for the optional Glass Package. 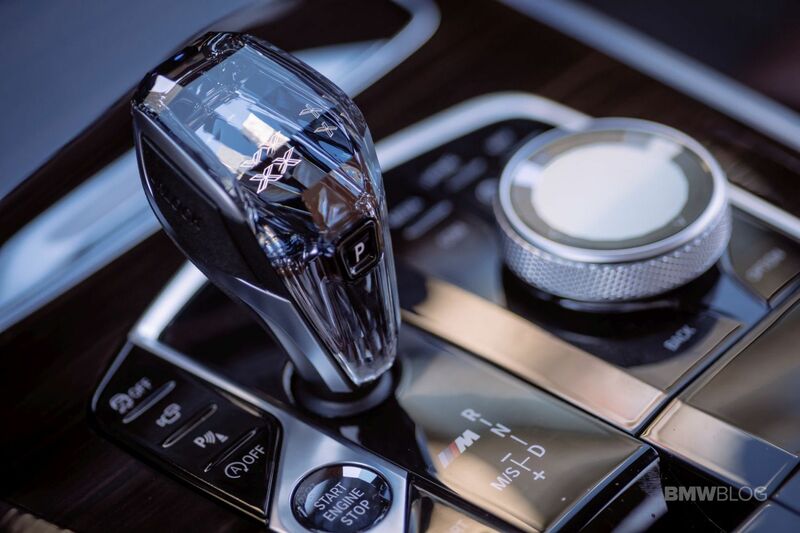 As you might already know, the Glass Package makes the lever look like a crystal, with an illuminated X located inside it, while also changing the volume control button, the Start-Stop button and the iDrive Controller to new designs. The problem is, the knob for the lever feels cheap to the touch. It’s made of plastic and it’s a bit rough around the edges – or should I say cuts? – not to mention if feels flimsy if you grip it too hard. 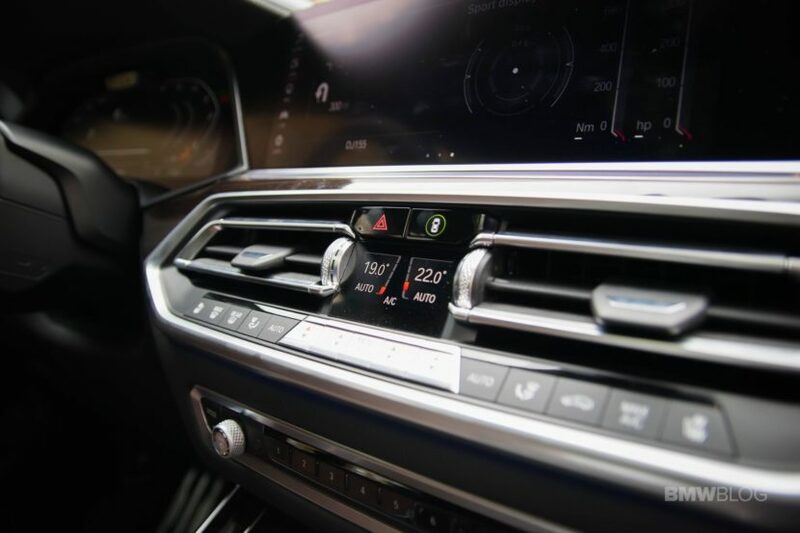 The plastics around the knob also feel hard to the touch and, the buttons next to the iDrive controller are a bit on the firmer side of things, making you press harder on them. Last but not least, the new iDrive controller doesn’t have the touch-sensitive cover up top, which helped you write down things in the infotainment system. I found that feature extremely useful in the past and it really is a shame that it’s not offered anymore. 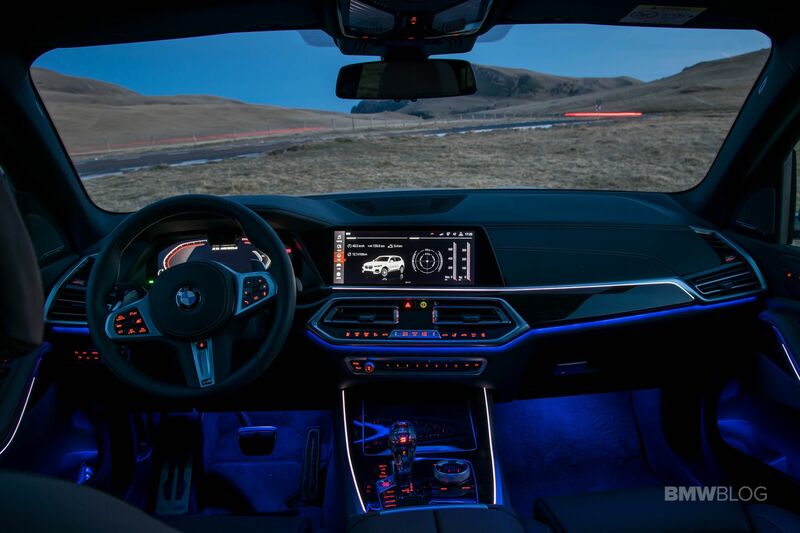 However, BMW wants you to use its brand-new Personal Assistant system which is supposed to be backed by AI and understand what you’re saying, so that it can make some arrangements. I found the Personal Assistant to work rather well most of the time but, as usual, when it comes to numbers it doesn’t really understand certain inputs. While it does understand to adjust the temperature inside the cabin, for each seat in the car, it doesn’t understand the number ‘11’. Maybe my pronunciation wasn’t perfect but besides me, three of my friends and the BMW Communications Team tried to input an address into the navigation system by voice and all of us failed. 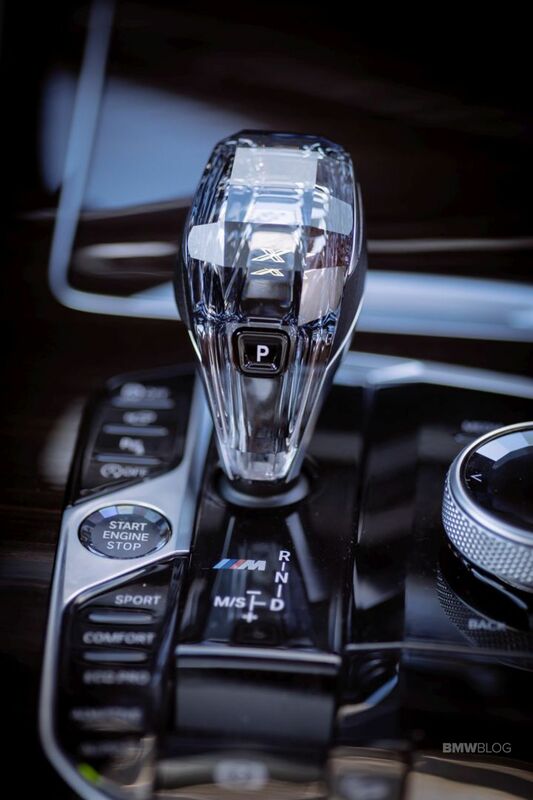 There’s clearly some more work to be done here but, as I gather from BMW, the system is learning and adjusts itself to your speech and patterns the more you use it. 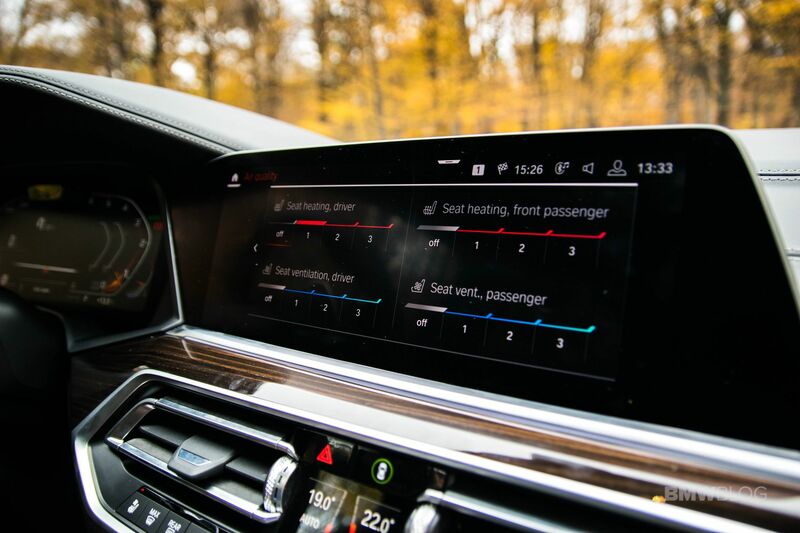 It can automatically adjust certain things as you get in the car in the morning, such as seat heating for example, on cold mornings, and is basically there with you all the time. But what is it like to drive? Well, BMW finally decided to stop trying to please everyone. Therefore, you can now configure your BMW X5 either to be a comfortable mild-offroader or a sport SUV that handles great. In this regard, the M Sport package and the Offroad Package basically speak for themselves. BMW is now offering all around air suspension as well as active anti-roll bars. The trick is, you can’t have them both at the same time. The suspension setup will be different, depending on what you’re going to do with the car. 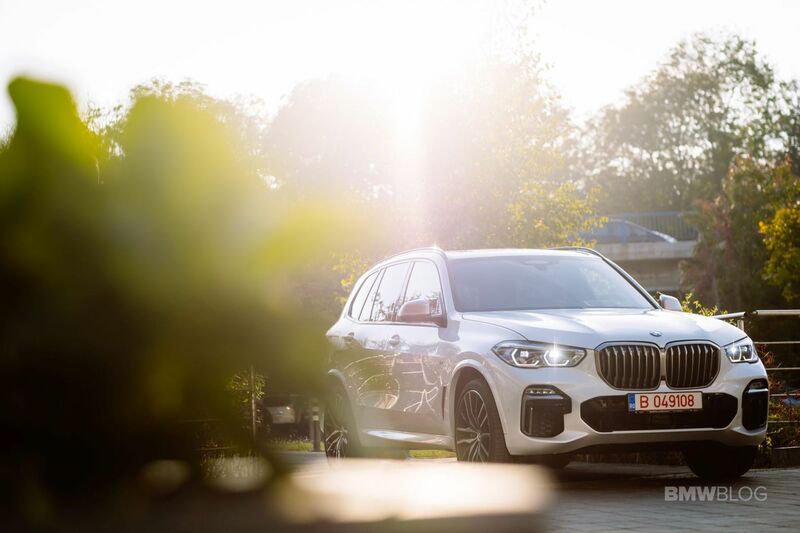 Our tester was a BMW X5 M50d and it came with the M Sport package as standard. The suspension, therefore, relies on steel springs instead of air bags and also comes with active anti-roll bars. For a car that tips the scale at 2.3 tons, they do come in very handy. Push the X5 hard and you’ll notice less roll than you’d expect, a sign that the active anti-roll bars are doing their job. Furthermore, the variable ratio steering and the active integral steering system come out to play as well. The integral steering function does wonders for this car but not necessarily when pushing it hard, as it can give off a rather peculiar sensation, making the steering feel a bit vague. However, when it comes to parking, it is marvelous as this rather big truck could use some help getting into tight spaces. Whether that’s a good buy for you or not, depends on how you plan to use the new X5 but I’d definitely go for the integral steering. The engine under the hood is still the jewel we’ve grown to love, from the new M550d G30 to the 750d. It’s the quad-turbo B57S and it’s finally available on the X5 as the old F15 model used the N57S tri-turbo unit of old. The new powerplant is smoother than the old one and a bit more powerful. With 400 HP and 760 Nm of torque coming out of the 3-liter straight six diesel engine, you won’t ever feel a lack of power, no matter how big this car may be. From standstill or even in high-speed overtakes on the highway, it’s a flawless engine that will eat away miles without you noticing while returning incredible fuel consumption figures. On the highway, with an average speed around 60 mph I saw a fuel consumption under 9 l/100 km (over 26 mpg US) while around town the lowest recorded number was around the 10 l/100 km (23.5 mpg) figure. That’s incredible for a 400 HP 2.3-ton SUV. 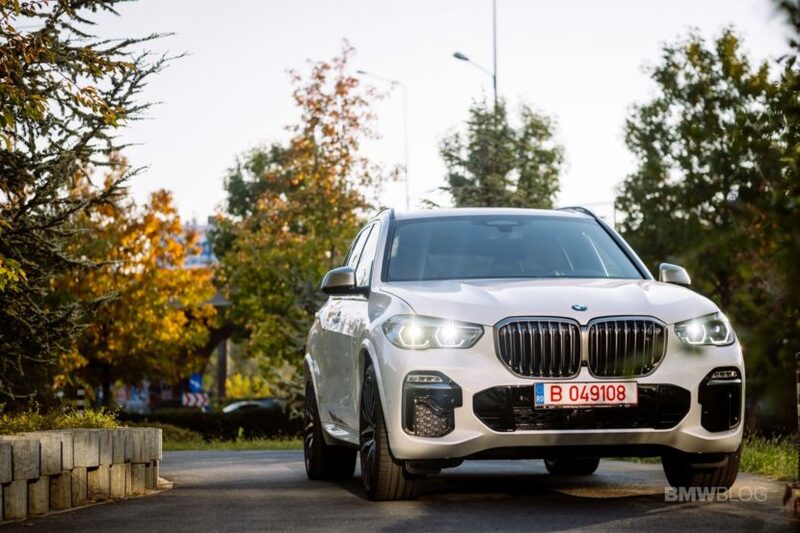 Speaking of towns, the X5 isn’t exactly in its element inside busy urban areas and that’s especially true if we’re talking old European ones, with those narrow streets and tight parking spaces. The car grew in every direction and it does show, but you are helped by a lot of electronic nannies as well as probably the best seating in the segment. 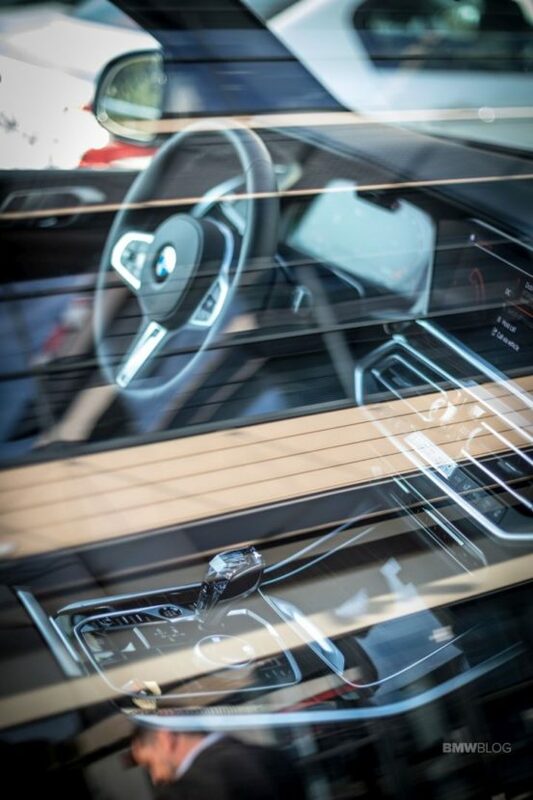 Sitting behind the wheel in the new X5 offers a commanding view of the road, great visibility through the side windows and even through the rear one. Electronic systems let you know when you have a car in your blind spots, the steering wheel vibrates when you’re going out of your lane and the car can even steer you away from danger and keep you in your lane. There’s even a new Reversing Assistant feature which can drive your car backwards up to 50 meters if you want to, in case you end up on a dead-end street or something. It really works and definitely makes life easier for the driver. 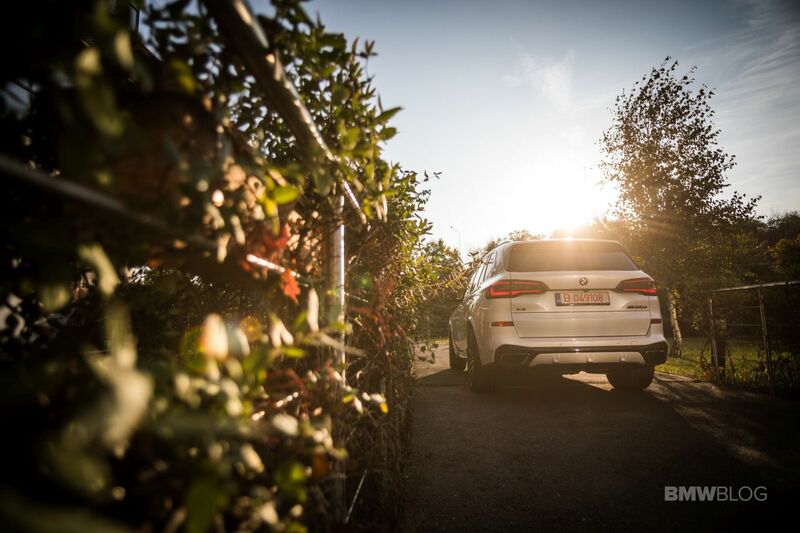 Drive outside the city limits and the X5 feels a bit more at ease. High speeds don’t translate into loud road noise inside the cabin no more, as things are noticeably better isolated this time round. There’s even an optional package available allowing you to get double glazed front windows to isolate you even more from the elements. Our tester had it and it worked like a charm, not to mention the sound the windows would make every time you closed them, making you feel like you were closing a vault, not a window. The ride is relaxed and can cover any type of terrain as well. I’d even say it rides better than inside the city, where the 22” wheels combined with the steel springs make going over small bumps a bit of an unsettling business. It’s also good to know that if you go for the Offroad package, you get air suspension which adjusts itself depending on the driving situation. At higher speeds, it will automatically lower the car’s ride height while if you’re going off road or loading/unloading stuff from the car, you can adjust the height manually. The off-road capabilities have been drastically improved, I’m told, but I didn’t get to test them out as our car was an M Performance model, better suited for road usage. So, what’s to take away from the time I spent with the new BMW X5? It’s pretty obvious that this car has the genes of a winner deeply infused in its chassis, a refined recipe if you will. The handling is the best in the segment in M Sport guise, delivering incredible performance for a car of this size. 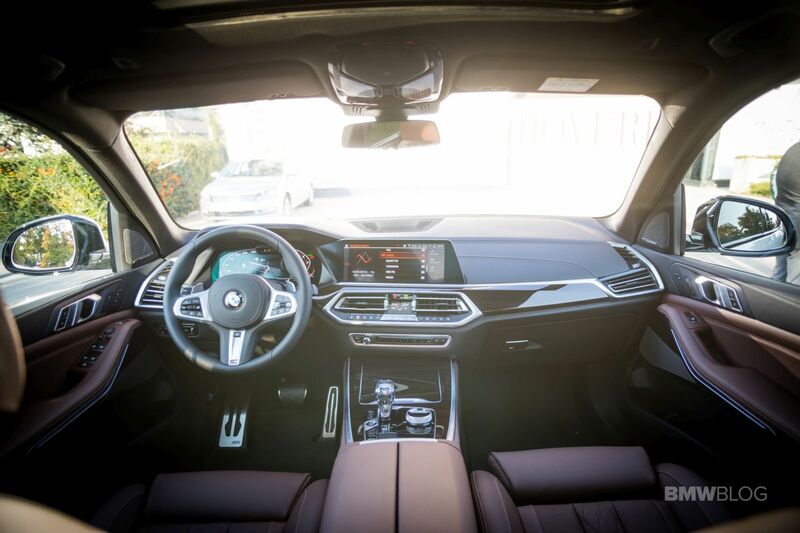 The interior is finally up to par with the rivals from Ingolstadt and Stuttgart, to mention just two, while the tech is probably class-leading right now. It’s a superb car and since the only faults I could find can easily be dismissed as nitpicking, I’d say BMW knocked the ball out of the park with the new G05 X5. Previous post How much would it cost you to own a collection of BMW legends?